Welcome to the Gimme Awards, North Carolina’s answer to the Academy Awards. Each year prizes go to the best in the growing film industry that makes our state a leader in film and television production. This year's awards are being held at (insert your venue). The posh surroundings could make an elegant backdrop for the drop dead gorgeous as well as those who simply drop dead! So grab your camera and your autograph book and get ready for a taste of show business as you've never sampled before. Anyone who's anyone in "the Business" is here. Be on the lookout for actresses Regretta Nuthin, Holly Woods, and actress-turned-agent, Penny Cash. Hot actor, Leadman Studd will grace you with his presence. Be sure to smile for the camera when you meet cinematographer, Vidi O'Taper. Harry Bigwig will be working the crowd for connections for future film deals for his studio, and Gabby Lott is sure to regale you with stories of his many years in show business. Amid all the glitz and glitter of the event, things could turn shady and dangerous! The show biz term "knock 'em dead" will take on a whole new meaning! 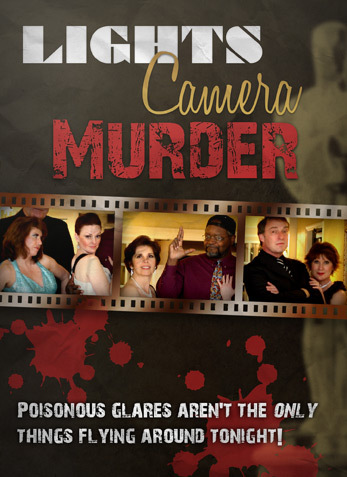 It will be up to you and your table of fellow sleuths to discover who the killer is. So, think of a clever name for your table, er, detective agency, and listen carefully for clues. At the designated time, your agency will be asked to formulate a question that your delegated chief detective will ask a suspect. Once all tables have completed their questioning, each detective agency will submit a solution sheet indicating "who done it" and why. The first agency to name the correct culprit and most correct motive wins. Good luck!!! This fading legend is the odds on winner in the Gimme race for Best Actress for her latest film, The River Runs Way Too Long. Will this diva get the Gimme or will she just simply "get it" tonight? This handsome lady killer is nominated for his portrayal of the sensitive yet tough detective in the thriller, Ultimate Force/Gentle Avenger. Will his secrets come to light and "ultimately force" the curtain on his career and his life to be closed? Well respected cameraman/cinematographer, Vidi is a shoe-in to win a Gimme for his work on the documentary shot in Africa, Plan it for the Apes: Primate Real Estate. One "shutters" to think of all he has seen through the lens of his camera. His forthcoming tell-all book could put either him, or his subjects, in the dark room forever. This bright actress with questionable talent was willing to live with the monkeys while filming Plan it for the Apes: Primate Real Estate . Determined to be considered a serious actress, she has scratched and clawed her way up in "the business." Will her animal instincts get her more exposure, or rather get her exposed? The best, most well-connected and enterprising agent in the state and co-founder of Cash, Cash, and Mo' Cash Talent Agency. She is attempting to revive her acting career...could it be that more than her career needs CPR? Head of U Otta B N Pikturz Studios, is he headed for trouble? Bad business deals and bedfellows could catch up with him in the end! Gabby is a veteran actor and game show host who is also tonight's Master of Ceremonies. He's a real talker, but is he telling everything he knows? Gabby, a former game show model, is currently the host of the popular nightly entertainment tv show "Entertainment This Minute" and is also tonight's Master of Ceremonies. She's a real talker, but is she telling everything she knows?